Your vehicles interiors have to take a lot of wear and tear, from varying ranges of temperature, dirt, water and of course natural wear and tear. Is it any wonder that after a few years they can start to look shabby and worn. At Midlands Mars we specialise in producing repairs which look natural and feel supple. The finished repair is an interior in immaculate as new condition! As leather interiors become more and more popular in vehicles today, leather repair is also becoming a more frequent need. Use our mobile leather repair service anywhere in the West Midlands and Staffordshire areas to have all your cigarette burns, holes, tears, cracked and scuffed leather bought back to new. We can even re-dye complete seats if required! Midlands Mars have spent years researching what we believe to be the best leather repair system available today. When the repair process is complete you will be left with a strong undetectable repair that still retains the soft supple feel of leather. Our leather repair process is used to refurb and rejuvenate leather in many sectors from Automotive, Marine, Aviation to the Home. The dye we use is also used to repair and re-colour vinyl and interior plastc trim. So for all your interior repairs Midlands Mars has it covered. 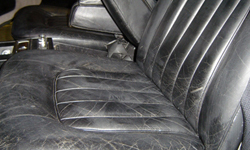 Use our same day mobile leather and interior repair service in the West Midlands and Staffordshire areas. 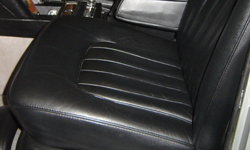 We will return your car's leather or interior back to new! We are able to refurb, re-dye or re-colour your leather, vinyl and plastic. All types of repairs, from tired and worn looking leather, to holes in your dashboard. 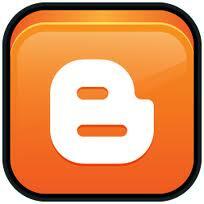 When repaired you will be left with a strong virtually undetectable repair. Before and After shots of a Bentley leather seat, this is what we can do for you!